1) The King Arthur Sir Lancelot Flour we use has a high Protein content, higher than that of Caputo 00. More protein, less carbs, helps to make for a light airy, chewy crust. Keep in mind that even with the best flour, improper kneading technique will still yield poor results. 2) The flavor of the Sir Lancelot is my favorite. You will know what I mean when you first just open the bag and sniff. Because we are using American flour and a grill, this means ours can't be called a "True" Neapolitan Pie. So that is why we call this recipe, Neo-New York. This will keep the folks with 1000-degree brick ovens and Italian flour from sending me nasty e-mails. The following is a list of things you will need in order to prepare this pie. For one, and you better get used to this, you are going to have to purchase some things on the internet because they are not really available on the retail market. Here is the list and where you can get the items. Some of these things you will probably already have. * San Marzano Certified Tomatoes \ Internet. May be able to buy locally, however to expensive. NOTE: For a healthier crust, substitute King Arthur Whole Wheat Flour for the bread flour. Makes an excellent crust! Also if you like a little bit more of a New York style crust, work in about 1\4 cup olive oil and 1\2 cup of corn meal into your dough, and use 1\2 cup bread flour. I make it both ways, both awesome! Use only fresh Mozzarella cheese, NOT the pre-shredded type. Shred your own fresh Motz or better yet, slice it, and put "Chunks" on your pie. Try not to use a watery fresh Mozzarella - the more solid the better! Fresh grated Romano and Parmesan cheese, on top of the Mozzarella. TIP: For a twist on the New York Style, try fresh smoked provolone cheese, then the Motz, then a few splashes of fresh grated extra sharp Cheddar Cheese. The purists would consider it quite unconventional, but I LOVE IT!!! Mix the ingredients and put in a covered 1\2 gallon ball jar and place in the fridge the day before you bake. 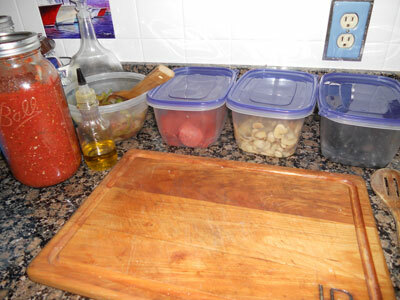 Don't store your sauce in a plastic container; a glass jar is best. On pizza day, take it out and bring it to room temperature. Be sure NOT to cook this sauce. The tomatoes have already been cooked in the can, they do not need to be cooked three times. 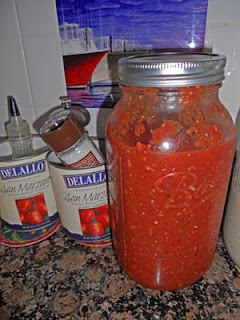 I have taken San Marzano tomatoes right out of the can, crushed them by hand, and it was a GREAT pizza sauce, without adding any other ingredients. It is a matter of preference, try both and see what you like. 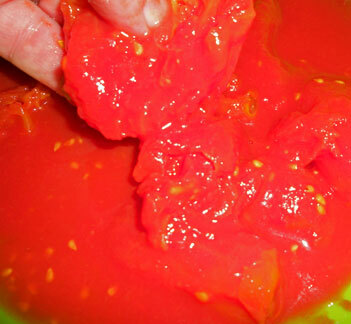 You can also use a hand mixer with the tomatoes, just do not over blend. If your sauce gets too watery, you can strain it, but usually this has not been a problem for us. My preference is to hand crush the tomatoes, add all ingredients and then chill in the fridge. After a few hours I will hit it with the hand mixer to smooth out the sauce a little bit, then taste to see if it needs anything. Ends up with a great sauce!! 1 Yeast culture starter. "Wild" or other. You can purchase a sourdough starter, like the King Arthur brand, that comes from a 250-year-old strain. There are cultures out there that are even many centuries older! For the purpose of the "Do it Yourself, Perfect Pie"- make your own wild sourdough starter, which is what I do. It may sound hard and a bit crazy to some, but it is so simple! Time to catch some fresh, wild yeast to get your own culture started! In a Ball jar, combine 1 cup of flour with 1 cup of bottled spring/filtered water. I set mine outside in mild weather, with the lid loose for several hours to catch the tastiest of wild yeast! Yes, I set my starter out on the deck to catch the salty Chesapeake Bay breezes, all to help enhance what we affectionately call "Jim's Starter by the Sea". After several hours, I set the jar in the oven with the interior light on, and the oven OFF, overnight. In the morning, I found a nice grayish fluid, which is alcohol, sitting on top of the flour. 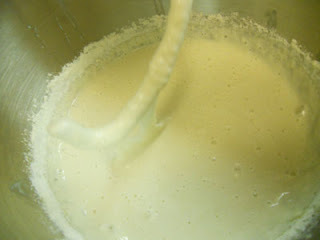 I stirred the liquid back in and removed ½ cup, before "re-feeding" the starter with 1cup flour, and ¾ cup water. By bedtime, I stirred the starter again, and on the third day, I stirred in the accumulated alcohol, removed ½" of discard, and fed again. Then let sit. Do this everyday for 3-6 days. My starter was ready to roll in three days, although it usually will take longer. Depending on the amount of yeast, and the temperature of the environment, it will take 3 days to a month for the starter to be ready to use. You ALWAYS when using your starter want it to be at room temp and be at its peak of activity. Do this by taking out what you need in the morning (or night before) and re-feed it with some flour and water and let it sit out all day, then use it in the afternoon \ evening and it will work great. When you store your starter in a fridge, the best thing to do is not use the top of the ball jar, use cellophane wrap and a rubber band around the top of the jar. Punch a very small hole in the cellophane to let the gas escape. I also have drilled some holes in the top of my starter jars and that works as well. Another tip is that once your starter is where you like it's flavor and aroma, you don't have to keep stirring in all the alcohol, you can pour some of it off, but I would not take 100% of it out. Leave a little to stir back in. One other thing about your starter, never, never, never add anything to it except flour and water. No packet yeast, sugar, nothing. I mean NOTHING!!!! Keep your culture as pure as you can. When not in use, feed it once a week and back in the fridge ya go! True, you can make a great pie with AP and bread flour. However, using the high gluten flour does make a difference in the dough. When you go out for a pie at your local NY style family Pizzeria, they most likely are using a high gluten flour product. 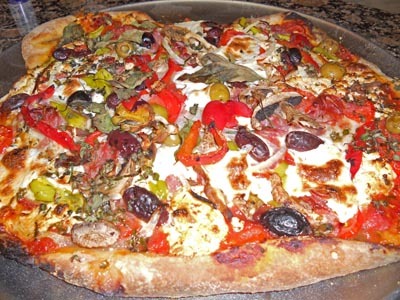 Great pizza is a combination of many, many, many little things, that will make a HUGE difference in your final product. The right high gluten flour is just one of those many things. 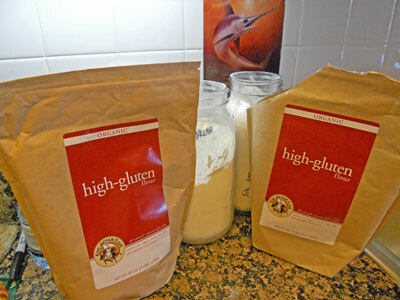 Don't waste your time looking for high gluten flour at your local grocery store, you won't find it. Order it on line and be done with it. King Arthur has probably the best flour you can get for making pies, "Sir Lancelot High Gluten Flour". This product can be ordered on line from their web site, no prob. Just order a case of it and don't worry about it. Once you use this flour, you probably will use nothing else for pizza dough. It is that good! The high gluten flour won't burn, even at the high temps we are cooking our pies! First, take your starter out of the fridge Wed morning and re feed it (the discard that you will bake with) as well as your "Mother Jar". Once your starter (discard) is ready later that day,(make your poolish) then start to prepare by adding in your mixer bowl the poolish and two cups of high gluten flour into your mixer along with one cup warm spring water. (I use Dasani). And one cup of bread flour. Save the last cup of flour to add slowly during the end of kneading. I like to kick up my dough a bit so I will hit it with some instant yeast, this goes right into the mix with everything else above. Do not put salt in yet. The reason why I use one cup of bread flour instead of all high gluten is because the bread flour will give the dough some extra strength. When you are ready to pat out your pie, you won't get any holes in your dough. Bread flour also is a high gluten product as well. TIP-IF YOU HAVE THE TIME, AUTOLYSE!! If you have got the time, Autolyse your dough. 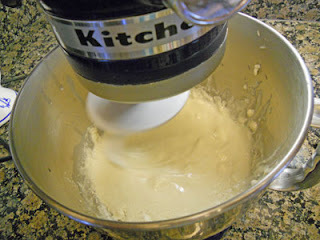 DO this by mixing your poolish with the flour to be used for the dough, and add one cup of warm spring water. Let sit in warm place for 30 minutes to up to four-five hours. Then continue with recipe. Add your poolish \ and four if did not Autolyse- to the mixer. Add one half cup warm water. This will be a very wet batter, will look almost like a pancake batter at this point, and that is what you want for now. Continue to mix for 13 minutes on low, then start adding in the remaining flour-SLOWLY (bout a cup) over the next seven minutes. 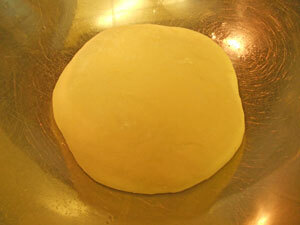 The dough should now start to form a soft ball. Increase the mixer speed during this last few minutes of kneading. Last-add your salt and a little olive oil if you like. Total kneading time in the mixer can be 18 to 25 minutes. If the dough is too wet at the end, just add some more flour, but don't overdo. You still want a fairly wet \ soft batter. You do NOT want, at the end of your knead, a somewhat thick hard ball of dough, you want it soft, high moisture content. It will be a little sticky on your fingers once you put it on the granite. Once you hit it with a little bench flour and hand knead it will not stick at all. It will be a VERY soft moist ball of dough. Then, pour dough ball on to a cool granite surface dusted with light flour. Try to use as little bench flour as possible. Hand knead lightly only for a couple of minutes. Form into a ball and place in a big bowl coated lightly with a little olive oil. 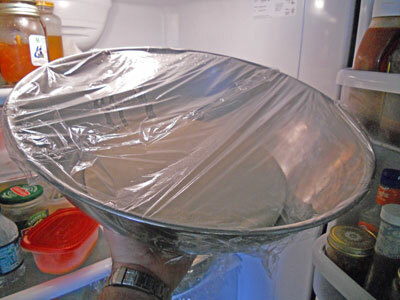 Let stand in covered bowl at room temp 1-2 hours or until it has increased by over a third in size, then cover with cellophane and place in fridge until Saturday morning. 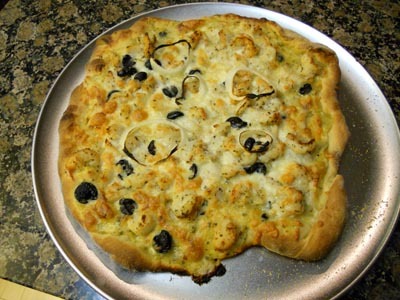 Day of pizza day, Saturday, take the dough out maybe two or three hours before your ready to make pizza. This last couple hours will bring the dough to room temp and rise a bit more. Don't look for double bulk, that sort of thing. This dough recipe is about six to seven cups of flour, of which can make several pies easily. Place six bricks (the ones with holes in them called Frogs) in the center of your grill and place the pizza stone on top of the bricks. Take your soaked Cherry and Apple wood chips and place them in your smoker box. This is a BIG factor in flavor and what separates this pie from most. The fruitwoods that are smoke on the grill while the pie is cooking. You will not believe how good this is, and it is what they do in Naples. The difference is I like the flavors of apple and cherry smoke as opposed to oak, and, I am cooking at 700+ degrees, not 900+ degrees. The pie is only on the grill for 7-9 minutes, and it is a good idea to rotate the pie just once half way through the cooking time. Not as important here as it is in a brick oven. The gas grill has the benefit of even heat distribution. Moisture is not really a problem inside the grill. In a 100% enclosed brick oven, I can see where gas fed fire could have possibly a moisture issue. Don't think for a minute the pie will taste like smoke either, it does not. The pie is not on the grill long enough. But it is just long enough to have just a hint of the flavor. Turn on your grill, all four burners, and set to "high". It is important that the bottom of your grill is clean and free of a lot of grease build up. If you have been smoking pork buts the previous weekend, you will need to clean your grill prior to pizza day. You will be cooking at high temps, and you don't want any flame-ups from old grease and food trash that is in your grill. CLEAN YOU GRILL! The reason for the Frog bricks is two-fold. 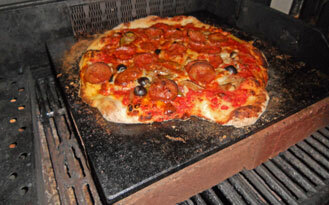 1) To elevate the pizza stone higher in the grill to take advantage of the higher temps. 2) The bricks hold a TON of heat and will help your pizza stone get even hotter, and maintain the same heat level while you open and close the grill. It is important to let your grill come up to temp, prob. around 45 minutes before putting your pie on the stone. The grill is now reaching the 700+ degree mark, the wood chunks have a nice smoke going and soon you are about to have one of the best pizzas you can have in the world, and it only takes about 7+ minutes on the grill. Remember that at the time of assembly, you want everything at room temp. The dough, ingredients, sauce, pretty much everything except the cheese, which should be kept cool right up until the time of prep. To prepare your pie, put your dough on your floured granite surface and pat out to the size you want. STRETCH the dough by hand. Go for a thin layer, but don't overwork it. It does not really 'Knead" that. Use as little bench flour as you can get away with. Do not use a rolling pin. Put corn meal on your pizza Peel and transfer your dough onto your peel. ALWAYS test your dough on the peel to make sure it does not stick. Work very fast once you put the dough on the peel. Add sauce to your dough, then the motz cheese and toppings. Don't overdo with the toppings, go light. Add fresh herbs, I like basil and some chives from your herb garden-very good! Also, top off the pie with a light once-over of olive oil. If you are going to be using veggie toppings, sausage, etc, PRECOOK them before it hits the grill. Try your first pie with just the Motz and one other item at first. You will find that the dough and sauce is so good, you don't really need a lot of other stuff on the pie. I am a pepperoni freak, so yeah, I cut my own fresh and it makes a great pie. The pre-sliced pepperoni can't compare. 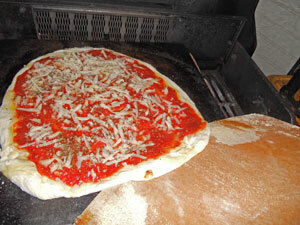 Transfer your pizza from the peel to the grill; cook for only 7-9 minutes. After the pie is done, transfer it to a pizza tray and serve. That is about it. I leave freshly shaved cheese on the table in case folks want to add more. It's Ready!! 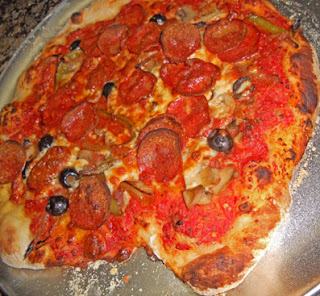 You will find that it is much harder to go out for pizza when you know that you can easily, and very much afford to cook some of the best pies in the world at home. That is what is so amazing; the cost of cooking these pies is very, very little. Do make the investment in the Sir Lancelot Flour, that is worth it for sure, as well are the San Marzano tomatoes. However the fact is, you can splurge on a couple of ingredients and have the best pizza in the world, at a third the cost of a mediocre, local conveyer belt-cooked pie, with ketchup for sauce! Lastly I would like to thank King Arthur Flour for making such a fantastic flour product. I have been using their bread flour for a long time, and the Sir Lancelot for Pizza Dough is just a dream come true. Thank you folks!! "May your future be filled with gourmet pizza for years to come!!!!" Since we published this recipe, we have moved on to a new grill that is better suited for grilling pies. It is a Infrared gas grill. This is a great grill for pies because the heat is more evenly distrubited across the grill and the heat stays hotter at the grill level because of the grates and plates above the burners. It also has a temp gauge right at grate level so you know exactly what your cooking temp is even at the crust level. This grill is getting 700+ degrees very quickly! I also bought a seperate smoker \ electric for doing our butts, ribs and chicken. Works great. The reason I went to a smoker is because I wanted to keep this new infrared grill ALWAYS extremely clean. At temps of 600+, flair ups happen EASY!!! You dont want any pork fat in your grill at all. keep your buts on a smoker!! King Arthur Flour, Norwich Vermont. A new Doll!!! She loved it. Thanks Ruthie!!!! Very Sweet. Below is the info on the new grill. I got it at Lowes, the model info is below. My other gril I got rid of was a four burner, and this is a two burner. I did not need the larger four burner because I bought a smoker, which is what I cook most of my meats on now. For the most part, I use this new grill mostly for pies, some non marinated steak, etc. The pizza stone fits on it perfect and the grill gets over 700 degrees fast. Simply, dont cook anything that is really going to make a oily mess, like pork buts, ribs, chicken, etc. Do that in your smoker. Keep the "Pie" grill very clean. Most importantly, clean you grill and the infrared plates after every use. Once the grill is cooled, spray everything down inside with a cooking oil spray. This will make clean up easy and most importantly keep the rust down. When you first get the grill, you do want to season it. 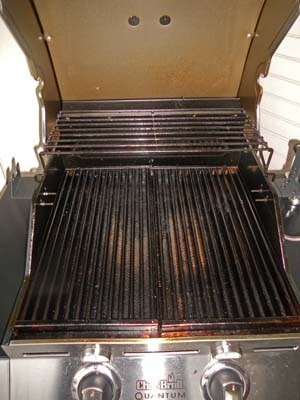 Spray everything down good with a cooking oil spray and coat the grates with a high temp oil like peanut. Run her at 700 degrees for 15 minutes. I did this three times before use. Keeps the grill cleaner and food from sticking. I forgot to mention, with this type of grill you dont need a smoker box for your wood chips. You just put some right in between the grates. Clean up is easy as can be. This REALLY works great for the pies on the stone. Better even than the boxes. You can put the chips right under the stone if you want. Really works good. The smoker is no big deal either, I only paid like 75 bucks for the electric brinkman smoker and I can put six buts on it, like 60 pounds of BBQ. Also can cook diff things at the same time. Chicken, ribs and sasuage, all at the same time!! So I use the smoker a lot, and it is TO easy! This way, my "Pie" grill can be mostly used for veggies, pies, steak, that sort of things. My new infrared grill and smoker take up less room than my old four burner grill. I live in a waterfront Condo and my grills are on the balcony, so space is a concern. We have more room now with two grills, than we did having just the one four burner! Thanks! I can't wait to give this a shot. I have crab apple tree and ornamental cherry wood. Would that work? I guess, but cant say for sure. I buy my wood chunks from ACE hardware. They have Cherry, Apple, Hicory, and others. Lowes carries the wood chips, which is good for the gas grill, the chunks are for the smoker. 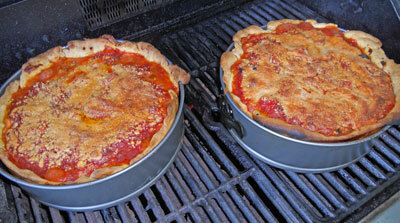 For sure, if your grilling pies, add some smoke, of course oak is fine, that is what most brick ovens use. Love to know how your pie turns out. Take pics and send!! YUM YUM. I am in charge of pizza night the day after Thanksgiving this year. Gonna be a hoot!! If you dont have a mixer, do an extended autolyse. I have pretty much started doing this with all my baguette's and pizza dough anyway. Also, I ALWAYS use at least on cup whole wheat flour in the dough mix. It adds better structure and flavor and is better for you. Here is what I would do for an example. First make your poolish from your mother jar and proof it overnight, like on a Wed. (If you are having Friday night Pizza. The next day, mix your dough and poolish and about a cup of warm spring water. Mix until it is hydrated, and set aside to Autolyse. I would let it set for four to five hours. Then add the rest of ingredients in your bow and mix with a mixing spoon. This is when I kick it with instant yeast. It should be a fairly wet batter. DO this for 10 minutes. Add salt last. Then pour out on to a floured surface and hand knead with some bench flour. Make into a ball, and put in a large bowl wiped with olive oil. Now, Place in fridge overnight. Cut your dough when ready, roll out by hand and make the pies. I have bought Delallo at Farm Fresh but they were six bucks. I just started buying CENTO for $3.75 (think that was it) at Wal Mart! Could not believe Wal Mart had them and at such a good price. I buy like eight cans everytime I go there now. You can also order them on line. JUst call some local stores or check them out next time your out and about. I was suprised Wal Mart had them, and a great price to. For the folks who say San Marzano is no big deal, all I can say is that maybe they got a bad can. Nothing else I have tried even comes close. Nothing. YES, I am a big sauce guy. My big reason I love them so much other than their flavor and color and packing, (sauce not water) is that they are not packed in heavy salt, and the tomatoes are NOT acidic. This means that the little bit of ingrediects I put in the sauce, are actually there in the flavor, without trying to hide an acid or watery -canned tast. Check Wal mart! 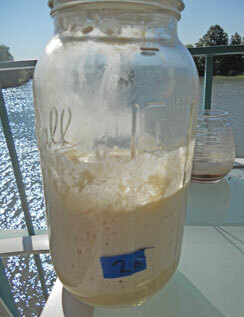 I made my wild starter on my balcony here on the Chesapeake Bay. AP Flour and Spring Water. Also I only use spring water when re-feeding and in my dough. NEVER any tap water at all, never. I also use wooden spoons for everything and wash them in hot water before stiring my starter jar. I shred fresh Parm and Romano and use whole milk motz. I oly do this when I am doing the full recipe. For quick pies during the week, I will go for the part skim just for lower calories. But for guest and the "Weekend" pie party, yeah, I go for the real thing. Also LOVE just a marinera pie. Nothing but sauce and grated parm and romano with fresh basil. Being a sauce guy, you know, I love that one a lot. Hey, take plenty of pics!!!! Maybe I will do a story about it on our Galley Blog! The only thing you are missing is the smoke flavor from the smoke box. You could do it in the oven if you have a good fan. But, then you oven will start to smell like a smoker, and that is not good. You could do this, and it would be great. I bought a brinkman smoker for only like 70 bucks or so and it is electric. So you can use it in a condo like I do. Put a stone in your smoker top level and fire up the smoker with apple and cherry. When you take the pie off the grill or oven, let it rest for a couple of minutes in the smoker on the stone. It would work great! Cant wait to see how it turns out. I am making baguettes starting tomorrow for Saturday Lasangna dinner to celebrate my daughter commin for Thanksgiving. Do you make the dough balls before it goes to the fridge or after it comes out from the fridge? Can you give more info about dough balling process? This is really great information I can not wait to try it. I dont put a lot of effort into to the final dough balls. Once on the second day all is risen, I just cut the big ball into the sizes I want and let those rise at room temp for a while. with a light coating of olive oil and a dusting of flour. Then I will roll them out by hand. Nothing fancy. BTW, we also make sefood -Shrimp and scallop- pies that are to die for as well as BBQ. All very good. For parties, we will ueually do a variety, everyone likes that. Something differant. 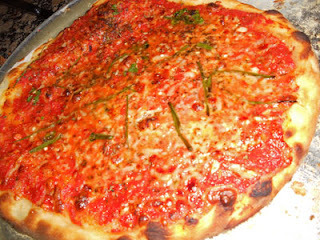 My fav is the Neo style or margerita, with of course lots of basil an Pepperonies, which does not make it authentic. Oh well! Cant wait to see the pics!!! Sure they will turn out great. Acknowledgement due to Jeff Varasano? Hi Jim. 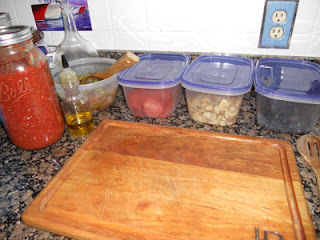 Much of what you've written is identical to how I make my SD pizza bases, and I developed my recipe and method after poring over Varasano's inspiring, obsessive - and didactic! - words of wisdom. Ditto the sauce - he insists that the tomato sauce should be uncooked, using San Marzano tomatoes. Like you, though, I do jazz my sauce up, and in this, depart from Varasano's recommendations. Using a BBQ grill is a departure from Varasano, though. I've read of others doing this, also. Must try it some time. I agree re the high protein flour, and on a lot of the other things you/Varasano say, but close as my recipe and method is to yours, I wouldn't claim to turn out the best pizzas in the world! You need to have personally sampled all the best on the planet to make that claim with any authority. That said, a good home-baked SD pizza is surely better than the offerings of the vast majority of standard pizza joints, and far, far better than the franchises like Dominos, Pizza Hut etc. However, without a woodfired oven, I don't think you can hit the extreme high notes of a top quality WFO pizzeria. Maybe you come closer with your grill method. Anyway, interesting post. Always good to come across a fellow SD pizza devotee. I do think the flavour of a SD base done well with extended fermentation etc is superior to any doughs I've made using commercial yeast - and lawd knows, I've tried a lot of 'em. You know what, though? I reckon a WFO at the right temperature makes one hell of a difference - more so than whether you use SD or commercial yeast as your leavening agent. A good dough, yeasted or SD, becomes a joy to celebrate when baked fast in a smokin' hot WFO Naples style. The transformation is a minor miracle. I'm sure all pizza afficionados agree that the crust is all-important. Get that right, and any good combo of quality ingredients will work beautifully as toppings. Hi Ross!!! Thanks for the post. I can't tell a lie, when I read Jeff's web post about rigging his oven I laughed out loud for about 10 minutes. I thought to myself, "No there is a Pizza dude I could drink wine with"
He makes some real good points, mostly about the dough and high heat. Where it falls short is cooking it in the oven and the lack of focus on sauce. Without a doubt, the guy knows his stuff, I would love to visit his restaurant sometime. It has got to be awesome! First \\ oven- Sure, great!!!! Done it a lot, but, to get "Close" to the real Neo pie, you need some fire and smoke. Our grill does that just like a brick outside oven, but I don’t get much over 750 degrees, I can’t bust eight. Our pies can cook in 7-9 minutes, where a 900 degree-er can bake in 2 to 4 minutes. (or less) These are ball park minutes, but you get the idea. Autolyse\\- right on, except I do a MUCH longer Autolyse, four+ hours, and then a slow cool ferment overnight. I also do the same for our Baguette's. This just makes a HUGE difference. And the more Autolyse, the less need for way extended mixing times. The other is the Sauce: I differ with a lot of folks here because I don’t care how good the dough is, I want AWESOME sauce. 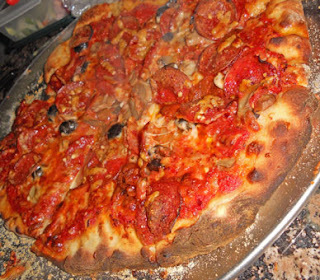 The Neo pie does not put much emphasis on sauce, just hand crush SM tomatoes, salt pepper and away you go. THIS IS GREAT! DONT SEND ME HATE MAIL PLEASE!!!! However, my taste, I like a little more jazz in my sauce. Yes, even a splash of Red Wine Vinegar. Try it, you will be amazed how much it lifts the sauce and gives it the perfect "Slight-Very slight" tang. I also like Garlic, olive oil, crushed red peppers and of course basil in my sauce, fresh cracked pepper and a little sea salt. I grow my own fresh spicy oregano and use that as well in the sauce mix. But nothing to heavy, all very light. So yes, I think with the right grill, and wood chunks \ chips, you can get as close as you can get to what you can get in a brick oven. The only diff is about 200 degrees in the oven. This is true. It does make some diff to. But so does raising your grill pie stone on bricks. WOW what a trick. That really works. Just need to watch carefully because it will cook a lot faster. Remember, the flavor you get out of a seasoned grill with smoke is going to be a LOT better than straight out of an oven. Both great of course! Pies done on a HOT grill with smoke on a thick stone with bricks, will blow away a pie done in the oven. You have to try it. DISCLAIMER: I bought a grill for the most part for just doing pies. The grill HAS to be spotless clean or you will get a flame up \ grill fire that you will not want for sure. When running your grill at 540 to over 700 degrees, there can be NO fat and grease in your grill. Most all grills that I have seen, do. And you don’t want that. After a grill has been used for a while with lots of marinades and such, it is very hard to clean it good enough to cook at these high temps. Your grill WILL catch on fire, maybe. Hell, mine always did. But I cooked a lot of ribs, etc on it. So, I threw it away bought a smoker and started with a new smaller infrared grill that stays spotless and is MUCH easier to clean. It is doing the trick so far. You are correct, a well-fermented SD pizza is hard to beat. I live in Virginia, and I can’t go to anyplace and get one better. Even some of the Pizza restaurant owners come to my place for pie. I wish I DID live closer to NY and be able to walk into the best pies in the world, or hop over to Jeff’s. Maybe he can open one up near us up here!!! Love that. I might disagree a little about the wood fired brick oven being more important than the SD. I don’t think it is. First, starting with a mother jar of starter, creating your polish, proper fermentation-Autolyse and dough, is more important than a brick oven. Fact is, you can get very close to the brick oven with a good infrared grill and good thick pizza stone and or brick plus oak, cherry and apple wood for smoke. 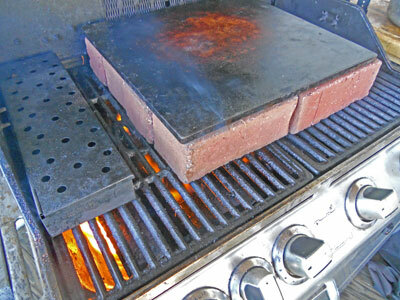 There is no difference between brick on my grill and brick in an oven. Both have to vent, and both are seasoned. The grill just cant to the high temp like 900+ degrees. This higher heat is important with the dough. I don’t think my dough is exactly perfect like that of a Neo done in a 1200-degree oven cooked in 1:30. But it is darn close. Close enough, I live in a waterfront Condo on the Bay, so I cant build a brick oven if I wanted to. Will someone please invite me and my beautiful girlfriend for the weekend who has a brick oven and we will compare pies!!! I like the Keys, anybody down there got one??? I forgot to mention that the additional differences in our recipe (version of pizza lol) which are many is in the autolyse. Here are the diff just in Autolyse. 1) I only mix flour, water, and poolish during Autolyse, no other ingredients. Other ingredients are added later. 2) as mentioned, ours is extended from 20 minutes to up to five hours. The Autolyse, differant flours we use, more tangy suace recipe, and the fact we cook on a wood smoked grill, all makes for quite a differant recipe and probebly taste. You know, the only two pies that I have tasted that taste a like is Pizza hut. YUK!!!! 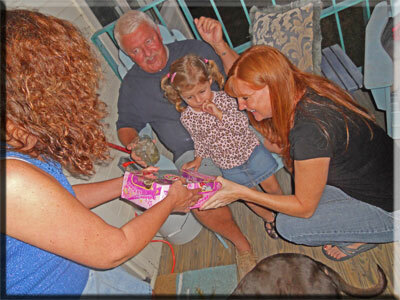 I am glad all our recipes vary, gives me more things to try! YUM!!!! I did not really think about it until I went back and compared the steps. Heck, my mind is going, I am getting old, almos 50!!!!! Glad I write our recipes down or I would forget them!!!! LOL but true. Have a great day! and really enjoyed reading your SD blog. Good Job!! Here are couple more pics, first one is our shrimp and scallop. Here is our Supreme, bothe great pies. 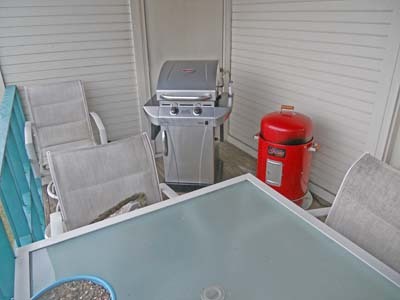 Hi Jim, another question on the grill - the one you use seems to be a two burner grill from what I could tell. They also make a 3 burner grill (and a four burner too)- I would think all things being equal the 3 burner should throw off more heat, and perhaps get you that extra hundred degrees or so? I am surprised that at 700 degrees it still takes 7-9 min or so given the heat. And at 900 you mention 2-4 minutes. Thus the thought that a larger grill might get to a three minute pie if there were no space constraints on the grill size? I have rigged my oven as JV has done and get 4 min pies at 650 but it takes 90 minutes to heat the oven and even then it works best if I shut the oven and turn on the broil cycle when the pie goes in. All has to go perfect to get consistent results. What I am really saying is your method seems far better for all of the various reasons you have covered, including wood chips. 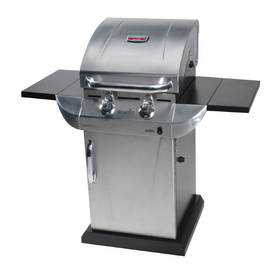 So I will be getting the grill, thus my question of three burner vs. two. I live in a town home and only have a 10 by 10 second story deck and three burner is like 55' long. But so what, if i get more heat, then the pies have priority!!! Your thoughts on this would be much appreciated. Thats a good question! I think, could be wrong here, but the three burner is going to give you the basic same amount of heat over a larger area. So if your short on room, go with the two. I looked at the three, and it was about as long as the four I used to have. ALSO the two can be a rotissary also, I already rigged mine. I LOVE to rotissary on the grill. Just put a drip oan under it, no mess at all. Here is a pic of the grilling surface. My large pizza stone fits perfect with room to spare. The chips go inbetwwen the grates. They cant fall into the grill becasue of the inrared grates. 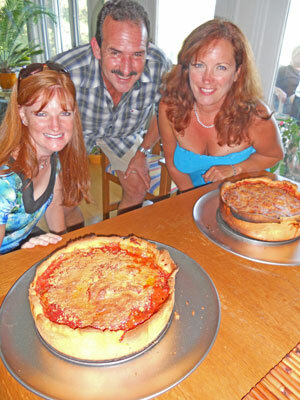 Chicago Deep dish also on the grill GREAT! We just updated some more info on the pies at our galley. link below with pics. The second book is called "COOKED" and will feature recipes from our program. Hope all is well and making some more grilled pies this weekenjd! !